Finally, Democrats have their reallife hockey stick graph. Never before have we seen the US unemployment rate rise so quickly over a 4 month period since they started tracking the statistic in 1948 than we have today under the Obama Administration. The unemployment rate under Barack Obama has gone from 7.6% in January to 9.4% in May– nearly two full points in 4 months. And, thanks to Barack Obama and democrats, the US Unemployment rate is worse today than if they never would have passed their stimulus package. The Obama Administration predicted the unemployment rate with and without President Obama’s stimulus package, the one that is supposed to “create or save” 3 million jobs. This is is a frightening trend. And I’m serious – I expected the numbers to flatten out like it looked like they were going to a few days ago. This trend is terrible – the unemployment rate change was 60% higher than what was predicted, and is a larger increase than from March to April. The US has lost 16,000 jobs each day since Democrats passed their MASSIVE Generational Theft Act, the largest redistribution of wealth from the private sector to government officials in US history. Via the Bureau of Labor Statistics– via Sweetness and Light. 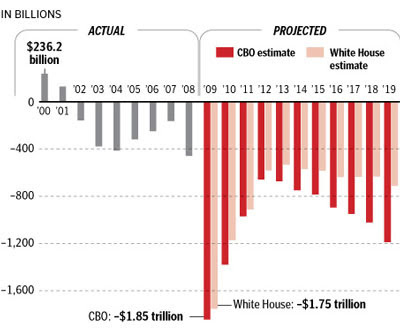 Obama will quadruple the budget deficit in just one year. No wonder China is looking to invest elsewhere.